Anonymous for the Voiceless is an animal rights organization that specializes in street activism. Established in Melbourne Australia in April 2016 they employ direct action with highly effective public outreach using local standard-practice footage of what “food” animals experience every second of every day, virtual reality technology, succinctly informative resources, and a value-based sales approach. 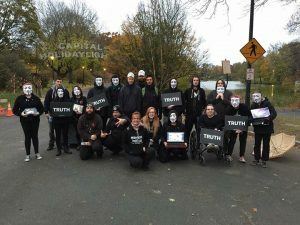 Now in over 246 cities around the world, they fully equip the public with everything they need in switching to a vegan lifestyle by an abolitionsist stance on animal exploitation. I am honored and excited to have started the Albany New York Chapter! We held our third cube on November 5, International Cube Day! There were 194 confirmed cubes taking place world-wide! 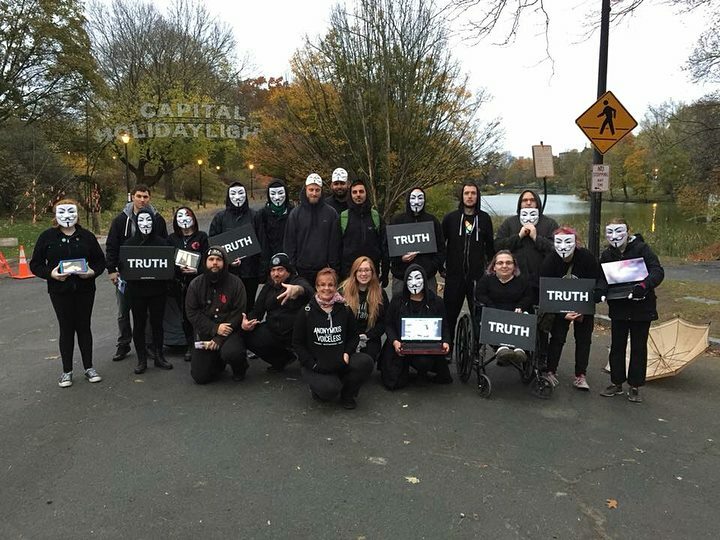 Albany had 20 activists showing up in the damp drizzly rain to participate in the Cube of Truth. 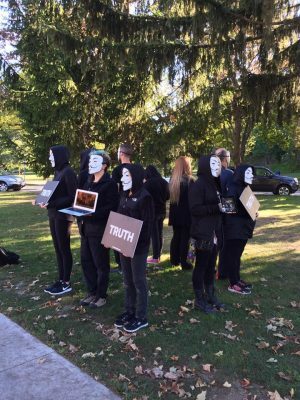 The masks represent the thousands of anonymous people who are standing against the violence and oppression of non-human animals in factory farming and when 8-12 people are all standing in a square with masks on it creates a fantastic aesthetic and spectacle! The masks make it more comfortable for the public to stay and watch the videos for longer periods of time. The masks hides any facial reactions and possibly judgement that people might feel. The activist becomes an impersonal symbol and prop, rather than someone judging others. Also many vegans are intimidated to be involved in advocacy because of the aggression and negativity others express when they speak about the abuse of animals. The mask allows a barrier to protect volunteers from this negativity and to help them become comfortable and confident in their advocacy.